One of the biggest excuses to avoid making your own images is to think "I do not know how to design". Another of the fears that surround your head is that you are not creative or skilled enough to make relevant designs. In this post, you will find a series of tools that you can use to make your own designs. When you get to know these online design tools, you're going to take that fear away. They have been designed in such an easy way that anyone with a little design skill and experience can make attractive designs. 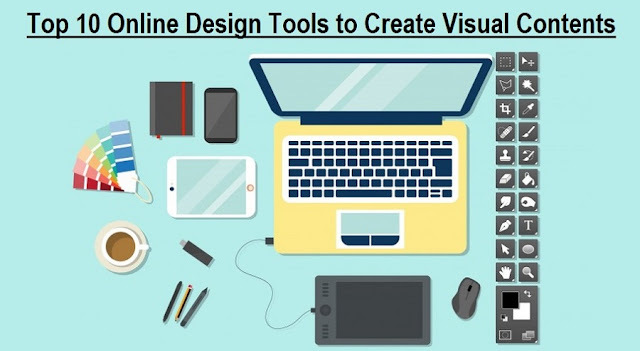 In this article we are sharing the detailed review on Top Ten Online Design Tools to Create Amazing Visual Contents for Business Websites and Social Media Channels by free and paid methods. Why Is It Important To Generate Visual Contents? There is nothing more intuitive and faster to capture than the information we see in image or video format. The brain processes visual information 60,000 times faster than text. It is demonstrated that a post with images generates more impact than one without images. FotoJet has a serious of graphic designs such as Facebook Covers, YouTube Channel Art, YouTube Thumbnails, Twitter Headers, Instagram Posts, Facebook Ads and what’s more, you can create a design with custom size for your blog headers and graphics. It has intuitive UI and easy editing tools. You can move, resize, crop photo to make it fit well into your design. And you can apply photo effects and color adjustments to photo. Add text and personalize font, color, size, style to make your photo more outstanding. You can use it for free and you can save your design without registration. But if you upgraded with a small fee ($4.99/month or $34.99/year), you can enjoy all the contents. Canva is another good tool to make designs for the usability of the interface and the variety of options that it offers. You can use free images and templates while others are paid, with a cost of $ 1.00 per image. PicMonkey is a great online design tool, with which you can make perfect designs. It is very intuitive and easy to use. It offers free and paid version. The price is very comfortable. To use all the effects, stickers, templates, you only have to pay $ 48 a year for the PRO version. I think it's a bargain given all the options offered by this platform. It has tips and tricks to make better designs, and the more you know this tool the more potential you see to help you in your business. Pixlr has the same facilities as the previous ones, but its interface is not as friendly as the others. It works very well, and has many varieties of fonts, stickers, effects, frames, etc. When you enter the website you will find 3 options, the online design tool is Pixlr Express and with it you will be able to design your images directly online. The equivalent version of Photoshop is Pixlr Editor and the application for editing images on mobile phones is "Pixlr O-Matic". Befunky is an online photo editor and a design tool. It has a variety of filters such as the famous Cartoonizer®, oil painting and cool pop art effects. You can use it from anywhere, on a Tablet, on the computer or on the Smartphone, as it has applications for each device. BeFunky's photo editor has smart retouching tools to fix poor lighting, digital problems, blurry photos, and other common problems with just one click. The tool is free, but has some PLUS options that cost US $ 4.95 a month or US $ 34.95 a year. Ipiccy, another online tool that has pleasantly surprised me. It allows you to retouch photos, has a lot of filters and effects, gives you the options to choose between cool backgrounds, modify them, choose different fonts, make your own shapes, and you also have a wide variety of stickers. The platform is simpler than it seems. Fotor, a photo editing software that you can download to your computer or install for Mac, IOS, Android, or Windows. It is especially useful for editing images. I found it a little complicated to use, because every time you make a change in a photo and want to do something else, you have to save it. You can create a collage, retouch a photo, and have a tremendous variety of cards for different events, such as birthdays, Christmas, Valentine's Day, Father's Day, Mother's Day, etc. Photovisi is basically a collage generator. There are many templates that you can use and edit. when downloading, you’re asked if you want to download it in high quality and without watermark, you must pay an amount of $ 1.99. PortraitPro, a photo retouching software that has been "trained" in human beauty. It helps to touch up the faces, granites, or spots that you would like to eliminate and even improve the texture of the skin. You can register and use the trial version or pay for the software $ 39.95 a year. Do you make banner campaigns for your website or the Facebook Ads? With Bannersnack, you can make those banners for free. It's an online application that offers you more than a thousand templates to use. It has some paid plans as well. I hope you will find this list of online graphic design tools helpful and will help to make your own designs easily and simply. Some other online design tools or software you know to make your own images? Leave your comment and expand this list.